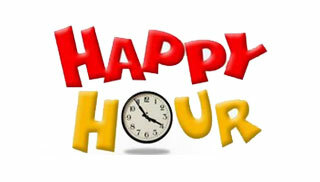 Happy Hour is on Wednesday through Friday from 4:00pm to 6:00pm and Friday and Saturday from 9:00pm to close! Selected Apps $4.00, $1.00 off Drafts and $3.00 Selected Bottles, House Wines - $4.00 per glass! TRY ONE OF THESE SPECIALS! A Screwdriver with a Twist! Tequila, Vodka, Orange Juice, and Red Bull!